Here you can [ download the C++ code] to do a Poisson disk sampling of a triangular mesh. The code is a simple wrapper for the vcglib library. It takes in input a std::vector of triangles and vertex position/normals and outputs std::vector of samples positions/normals computed with the Poisson disk sampling. EDIT: Victor Martins pointed out that the above code doesn't compile on MAC and kindly provided an [ update] bundled with a newer version of vcglib. N.B: if you are looking for a way to do Poisson disk sampling fast/in real-time take a look at this siggraph paper and matlab code. There is also a C++ implementation here. Vcglib provides a lot of features for geometry processing and is a header library (so it's easy to install). The main drawback of the library lies in: the documentation which is not exhaustive and the heavy use of templates which makes it hard to decipher. Hopefully this wrapper will accelerate your work to implement Poisson disk sampling with vcglib. /// and find  nb_samples by finding an appropriate radius. /// @param nors : list of normlas coresponding to each verts. /// @param tris : triangle indices in verts array. You can see the results of Poisson disk sampling with MeshLab. 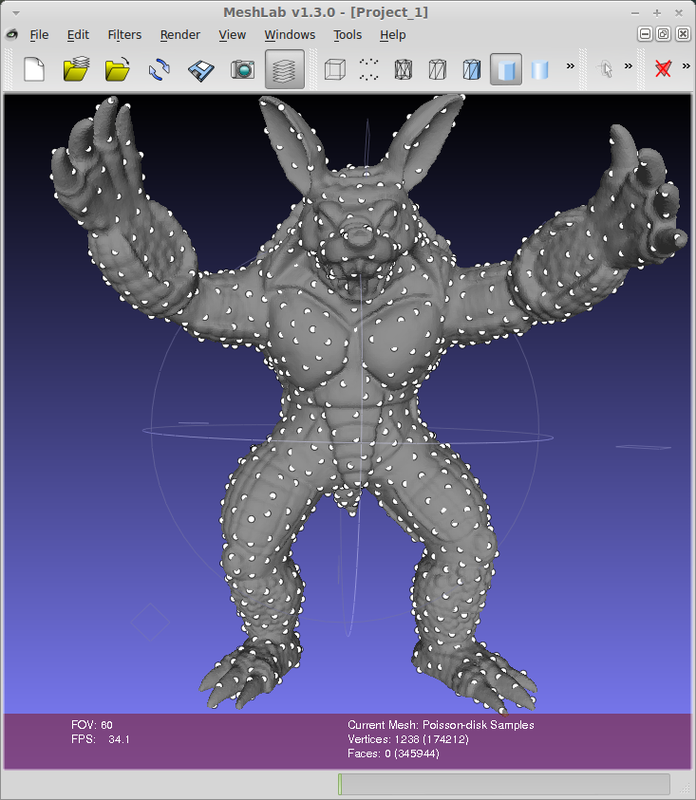 MeshLab implements the features of vcglib and is great to test them or see how to use them within its source code. In "View ➞ Show Layer dialog" you will see the mesh and its associated samples.